There are an estimated 80 million unexploded cluster bombs remaining in the Laotian jungle along what used to be the Ho Chi Minh Trail. This was one of many interesting facts related by Peter Alan Lloyd when he spoke about his book, “Back” to the Pattaya City Expats Club on July 14. Peter said that he wanted to write about the consequences of the Vietnam war as it affected Laos, but to do so in a 21st century context. It took him a few years to figure out how to do it. The book is about the juxtaposition between the Laotian jungle during the Vietnam War and now, when Laos is at peace and so firmly on the international backpacker circuit. 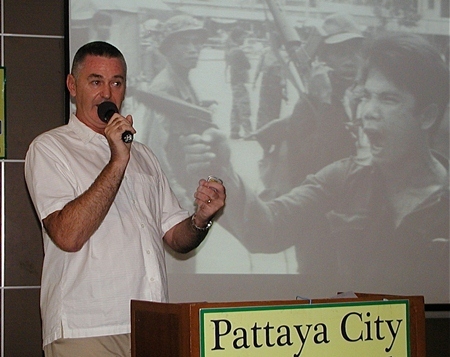 Author Peter Lloyd from the UK was speaker for Pattaya City Expats on the 14th of July. Peter talked about his on site research into the Vietnam War, particularly the Ho Chi Minh Trail, then and now. Peter shows a map of the Trail, from North Vietnam through Laos, into Cambodia, then into South Vietnam. Peter’s book, “Back Part 1: Across The Fence” follows a covert 1968 Special Forces mission to the Ho Chi Minh Trail in Laos, led by Spike Miller. “Back Part 2: Into The Jungle” follows modern-day trekkers including Spike’s grandson, Mark, into the Laotian jungle as they travel to the Ho Chi Minh Trail in the tri-border area of Laos, Vietnam and Cambodia, looking for what Spike left behind on his 1968 Special Forces mission. Peter focused his presentation on the Ho Chi Minh Trail, which played a very important part in the war. The trail was used to get men and munitions to the Vietcong fighting in South Vietnam. Peter explained that the Ho Chi Minh Trail was not just one trail; it consisted of four main trails and countless smaller trails. The trail went south through Laos for hundreds of miles and through mountain passes allowing access to South Vietnam at various places along the way. During the war, the trail was subjected to massive aerial bombing and defoliation by the American forces. They tried to bomb the trail into oblivion, Peter said. Every time a bridge was destroyed, North Vietnamese engineers would rebuild it. Peter felt that the engineers were brilliant and that nothing could stop them reconstructing a bridge. Further, the Americans tried everything; even dropping bombs that on impact dispensed a viscous liquid in an attempt to make the trail impassable. But the Vietcong found a solution; they spread bamboo matting on top of the liquid allowing the traffic to continue. The Americans also dropped listening devices designed to detect movement on the trail. At first, they disguised the devices in something that looked like dog turd. However they were easily identifiable as there were no dogs on the trail. Other listening devices were designed to blend in with the surrounding foliage. A Chinese tank discovered on the Ho Chi Minh Trail in Laos, having been buried by a landslide. In addition to the listening devices, Peter showed photos of the different types of bombs that were dropped. Peter mentioned that Laos is the most bombed country in the world. There were 600,000 bombing missions in Laos during the war. Peter said that after each bombing raid, the trail was back in operation within 24 hours. In researching his book, Peter spent some time on that part of the trail that runs through Laos. An Unexploded Ordnance (UXO) team was working to clear the trail of unexploded bombs. Peter said he and his party had to sign a waiver absolving the team of responsibility if anything happened to him on the trail. After signing, UXO team started stripping mines from the road he had just driven down! Peter said that gave him quite a shock. He also said that 600 troops (Americans and their allies) were captured in Laos and that none were released. One prisoner of war escaped; his story was told in the movie “Rescue Dawn”. Peter said that he believes there were prisoners left behind in the jungle after the war, but he thinks none of them are alive today. Peter said that, of course, the towns and villages near the trail look a lot different today than they did during the war. Still, he was surprised to find a restaurant that offered happy weed shakes and opium joints. Further, that he has been invited to go back to the jungle with people from JPAC (Joint Prisoners of War Accountability Command), an organization that conducts searchers for remains of missing American military men. Peter is from Liverpool, England. 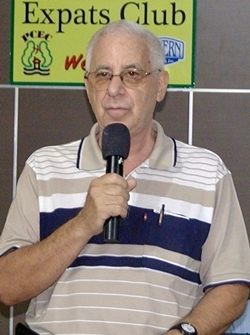 In addition to being an author, Peter is a lawyer and has worked in the mining business. 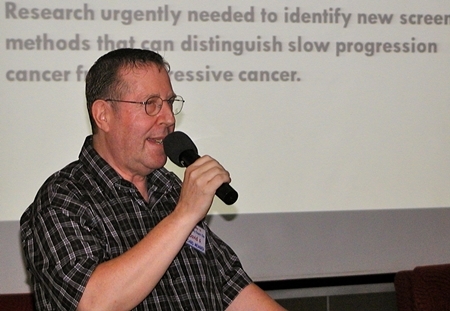 Peter is also a commentator on Pattaya’s real estate, business and social issues. Peter’s book is available only in electronic form from sites such as Amazon. For more information on the books and on other news related to the Ho Chi Minh trail, visit Peter’s website at http://peteralanlloyd.com. After the presentation, Master of Ceremonies Richard Silverberg updated everyone on upcoming events and then called on Roy Albiston to conduct the Open Forum, where questions are asked and answered and comments made about Expat living in Thailand. 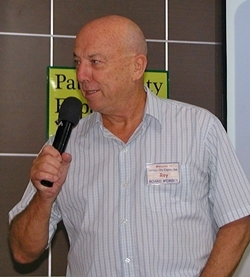 To learn more about the Pattaya City Expats Club and its many activities, visit www.pattayacityexpatsclub.com. A tunnel in the Vieng Xai Cave Complex in Northern Laos, where many US POWs were held during the war. None were ever returned. Khmer Rouge soldier holds a gun to the head of another expat foreigner. 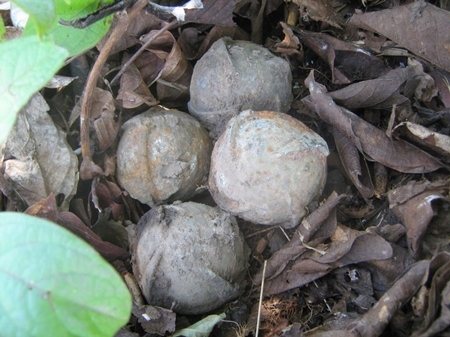 An estimated 80 million cluster bombs still litter the Ho Chi Minh Trail in Laos.